You may not have heard formally of this little-publicised initiative that is thriving in the Strut. It is similar to the more familiar “Young Eagles” program(me) but offers opportunities to those who are, well, of more senior years. This brings its own challenges such as how to fold up old joints so the body is small enough to fit the doorway, and balance on one leg while leaning over backwards, (No, I don’t mean the pilot!). 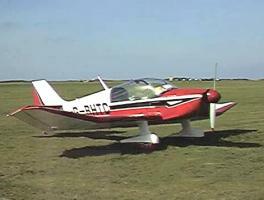 The principal compensation of the ‘Old Buzzards’ scheme for the generous pilot/owner is that rarely does one have to reassure anxious parents that their cherished offspring are perfectly safe, and that aircraft do sometimes have to “lean right over”. Just such an opportunity arose recently when one of our number offered a bit of Jodelling to a novice strut member, and an old friend Bill. 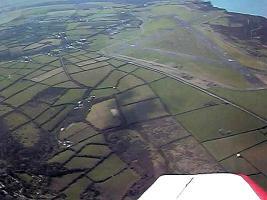 Making most use of the fabulous pre-Easter weather, Graham suggested a day trip from Kemble to Perranporth. Initial thoughts were for Bodmin, but with 3-up in the Sicile and one of those not much short of 100kg, hard runways of fair length were felt a safer option. With front tank full, and enough in the main tank under the seat for taxiing and a safety margin, the CG calculations were considered satisfactory for G-BHTC to set out. Waiting just long enough for the mist to clear at the destination, the trio got airborne at 1130 hrs and headed 220 magnetic at 2,500 feet, towards the Mendip mast and the South-West. Bristol ATC was heard to warn traffic of a “slow moving” aircraft - cheek! 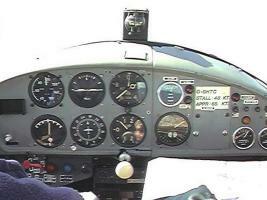 At 105 knots IAS and 2400 rpm on the Potez engine, that was a good speed. Lakes, rivers, main roads and railway lines (dis.) all passed below, clearly visible in the superb glass-clear new bubble canopy expertly-fitted over the winter by Graham. Bridgewater slipped by, Hinckley Point, the Blackdown Hills, Exmoor and then the surf beaches of North Devon and Cornwall appeared along with their RAF Coastal Command stations - St Merryn (see last Newsletter), St Eval and St Mawgan - only the last still active. 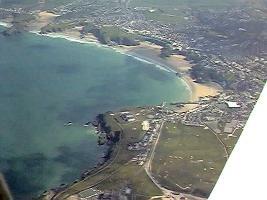 Then it was Newquay, its harbour clearly visible, and soon after Perranporth with long surf-driven beach, town, and the airfield perched on the cliff top. 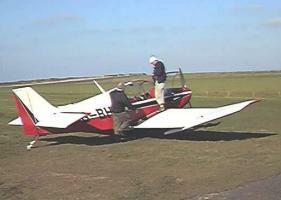 A couple of gliders were the first nearby aircraft seen on the flight. 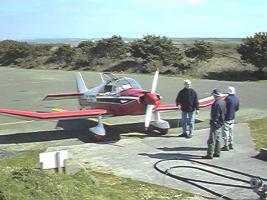 After a circuit to assess conditions, the Jodel glided gently towards the threshold of 09, a bit of power, a request to use the grass runway alongside the tarmac to help make a gentle touchdown in the gusting 140º side-wind, and all were down safely after a flight of just 90 minutes. 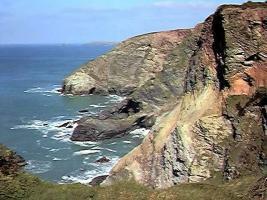 Once refuelled, picnic lunch was taken on the sheltered side of a small headland looking out at the blue-green sea, white surf and the magnificent cliffs, with an unusually convoluted orange-red rock strata that would seriously challenge a geologist to interpret. A stiff walk down the path and over the next headland led to a ‘Pub-fall’ where a tea-tray placed somewhat incongruously on the bar, refreshed the three. If not actually the last of the summer wine, there seemed at least a slight hint of it in this group of three. 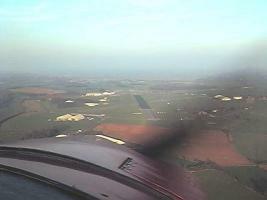 Regaining the Jodel, Bill and Dave swapped places for the flight back and then took off, the wind much more gentle now, but with a headwind component making the return leg to Kemble take slightly longer. It had been a wonderful experience, a great introduction to cross-country flying and confirmation of what an enjoyable hobby flying a light-plane like a Jodel can be. Lots of valuable information was exchanged on training and ownership options and their relative costs (which the ‘better-half’ might summarise as ‘high’, ‘even more costly’ and ‘outrageously expensive’), maintenance, and operating considerations. Most of all it was a superb day out, and very special for me personally. Thanks a million, Graham. 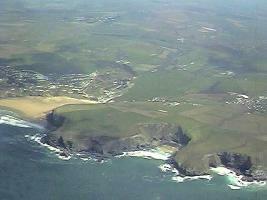 Oh, and we did see a real Buzzard just after take-off from Perranporth.